Meandering around the charming streets of Copenhagen, holding hands with his wife, Rob spotted a sign that said “Quality Vintage.” Despite its vagueness, it seemed to call his name down an alley to investigate further. In between visiting friends in neighboring Germany, pub crawls, and photo ops, Rob had been keeping his eyes peeled for watches. He wasn’t holding out much hope that this ambiguous sign would direct him to a killer watch, but still, he didn’t want to leave any stone unturned. A few minutes later, when they arrived at the address, he discovered from their window display that “quality vintage” was code for resale boutique selling women’s clothing: A dead end... at least he tried. As Rob crossed the threshold, he could feel his palms start to sweat and his heartbeat rev up: the thrill of the chase was well underway... When he held the Speedy, it took all of his strength and mental energy to take deep breaths and play it cool: Rob didn't want to let on that it was a prized watch if the shopkeeper didn't know it. The story goes... the shop's owner bought it a few years earlier at an auction, so he knew what he had, and priced it accordingly. But he also didn't want to let the moment pass him by either. Something told him this was a legit “Ed White.” So what he did leave with was the owner’s email to get back in touch. When the door shut behind him, and they got around the corner, he finally exhaled and showed his excitement - he was "practically shaking." To calm down, they headed to a nearby pub, nestled into a booth, and ordered up a pint. What should he do? He wanted his wife’s opinion. You see, back then, Rob wasn’t working and they’d just spent a lot of money on traveling. He wrestled with the idea of being responsible, yet also being opportunistic. His wife encouraged him to pursue this Speedy, not because it could prove to be a wise investment, but because she saw how genuinely happy her husband was finding it and imagining the prospect of owning it. This was his dream scenario playing out in real time: Discovering an unbelievable watch in an unconventional way. There was no guarantee it would happen again; she wanted him to live the experience. Rob felt like he had no time to waste. He immediately tapped into the bar’s wifi, and proceeded to open up tab upon tab of Speedmaster-related info. In particular, he needed a crash course on the ref. 105.003, the model for sale at the shop. His education continued when they returned to the States. He learned the story behind Ed White: In 1965 Captian White wore this model when he became the first American to “walk” in outerspace. More importantly, Rob became familiar with the crucial details that confirm the watch's originality and determine its value (e.g. handset, dial, bezel, lug condition). He soon felt confident enough for a second look. He emailed the shopkeeper requesting pictures so he could compare his notes with the watch. Let's just say the owner wasn't the most adept at the nuances of watch photography. When the photos downloaded, Rob had to work with blurry snapshots taken in abysmal lighting (see picture below). The roller coaster of emotions he'd felt so far and effort he'd put forth didn’t end once they agreed on a price... He faced more anxiety and stress when it came to paying for and receiving his watch: Rob asked the owner to set up a PayPal account so he’d be protected should anything go wrong with the transaction. When Rob got confirmation that his “Ed White” was on its way, he noticed it was headed to the wrong address! He’d moved since the last time he used PayPal and never updated his profile. A nightmare customer service experience with FedEx ensued in order to reroute and eventually take delivery. 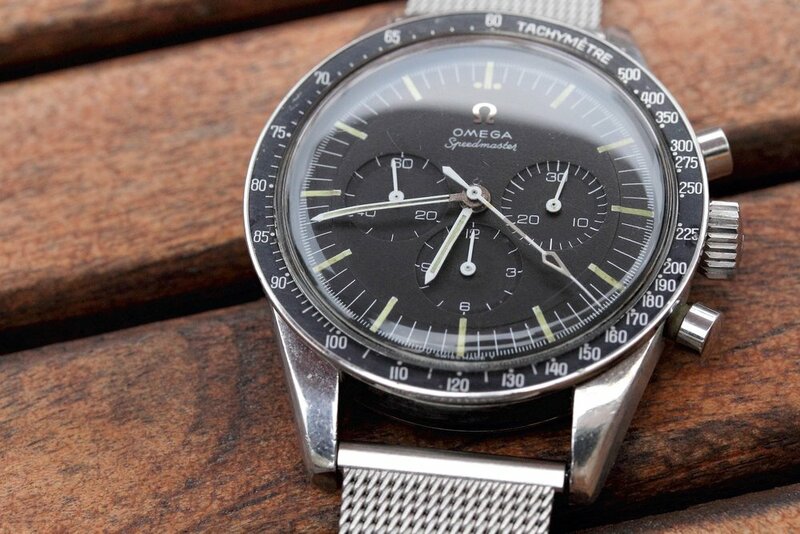 But when this 1965 Speedmaster was finally in his grasp, it was better than he remembered, and certainly better looking than the photos he was emailed. Of course, a little polywatch on its crystal went a long way too. 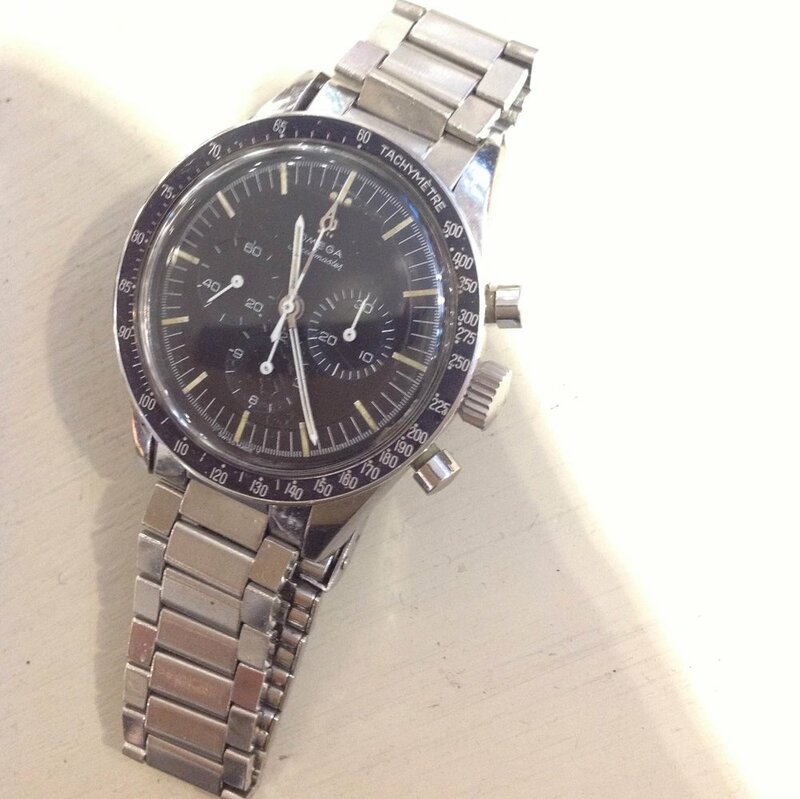 This is a watch he plans to never get rid of, partly because he’s attached to the way he found it: This experience was Rob’s first time feeling the rush that comes with finding a truly great vintage piece. The circumstances were a springboard to his preferred way of collecting - bypassing dealers and acquiring directly from owners. Another reason it'll be with him for the long haul is that his wife loves it too: For her, it’s a memory of their trip and something that makes her husband happy, which is what it's all about. 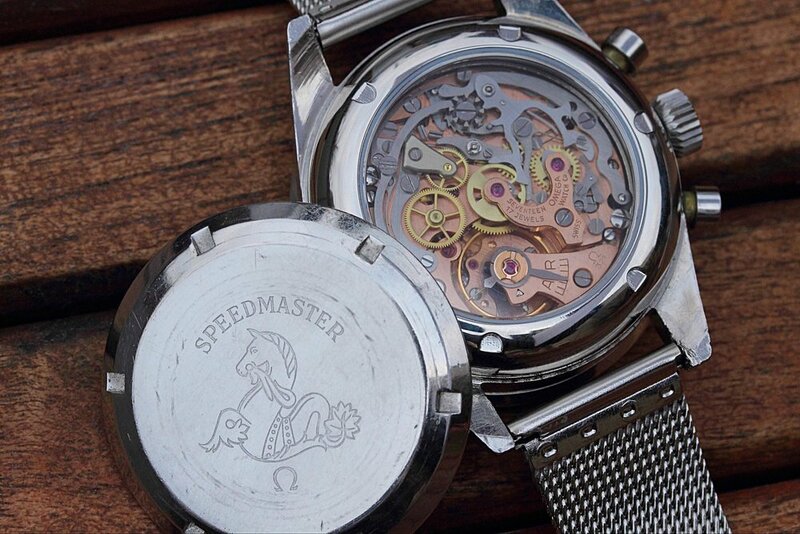 Rob’s stumbled on a few more incredible watches since this lucky find. To see them all, and tag along on his watch-hunting adventures, follow him on Instagram @bazamu. And check out Rob's website bazamu.com to see his entire collection and read the story behind each watch.